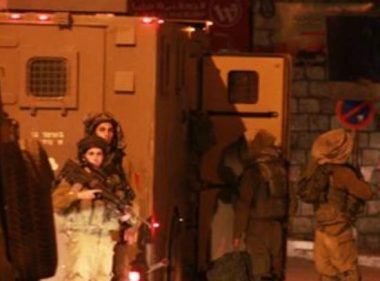 Israeli soldiers abducted, Thursday, a Palestinian man from Hebron city, in the southern part of the occupied West Bank. The Palestinian Prisoners’ Society (PPS) has reported that the soldiers invaded Wadi as-Somman area, in Hebron, and abducted Husan Abu Sneina, 27, after storming his home and violently searching it. The soldiers invaded several neighborhoods in the city, and some surrounding communities, installed roadblocks before stopping and searching cars, and questioned many Palestinians while inspecting their ID cards. On Thursday at dawn, the soldiers abducted Shadi Abu Na’im, 22, from his home in the al-Mughayyir village, northeast of the central West Bank city of Ramallah. Also at dawn, two Palestinians were injured after being attacked by illegal Israeli colonialist settlers near Nablus, in northern West Bank. Furthermore, a group of colonialist settlers invaded the village of Orif, south of Nablus, and attacked homes and cars, causing property damage.